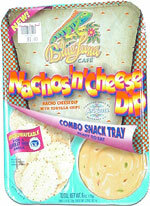 Taste test: This snack kit combines small round white corn tortilla chips with a nacho cheese dip. 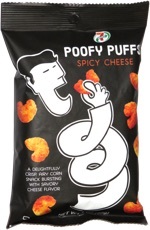 The chips are good, and the're small enough to easily fit inside the small dipping bowl. The dip is tangy and somewhat hot with a noticeable jalapeño taste, and there was just about the right amount of dip for the number of chips provided (which seemed to be quite a few chips squeezed into a relatively small container). Smell test: No particular aroma for the chips. The cheese is OK.
Company: Blue Luna Café S. p. A. This snack was discovered by Keith and Melissa at Blockbuster Video.